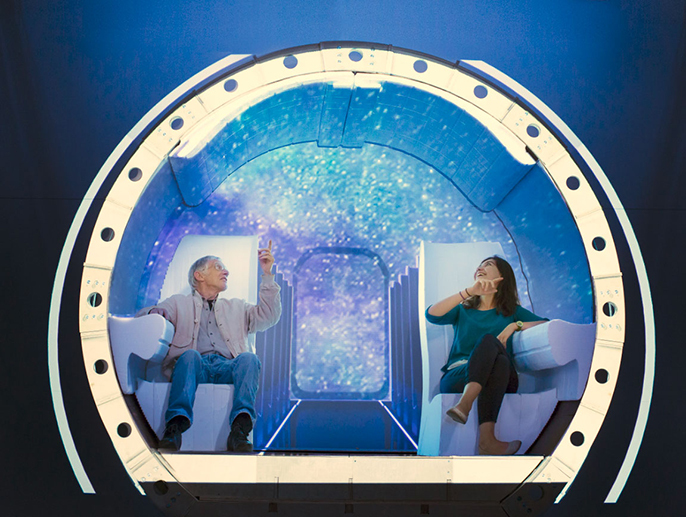 Craig Hodgetts, left, a professor of architecture and urban design, and graduate student Aysu Unal sit in a prototype of the Hyperloop. Follow the contest and see results at Hyperloop Pod Competition. In 2013, Tesla Motors and SpaceX co-founder Elon Musk floated the idea for Hyperloop, a system that propels passengers inside pods at nearly the speed of sound through a network of tubes between cities. But the billionaire inventor, saying he was too busy building electric cars and rockets, encouraged others to make Hyperloop a reality. Engineers and researchers around the world, including students, researchers and faculty from UC, have taken on the challenge. UCLA graduate students and faculty collaborated from August 2014 to June 2015 with Hyperloop Transportation Technologies (HTT), one of two startups attempting to build a system. The company plans to break ground on a test track this year. UC students are also part of a SpaceX college-engineering contest to design aspects of Hyperloop pods. Nine teams from UC campuses were selected to compete in the design round of the competition held on Jan. 29-30. The UCLA Department of Architecture and Urban Design’s IDEAS lab was set up to cultivate creativity, and it’s where graduate students working on Hyperloop concepts conducted a collaboration with HTT. Shijie Zhang M.Arch.II ’15 at work on a model of the Hyperloop station. “Our class provided the fundamental material that is still being employed,” Hodgetts said of ideas from UCLA students being used at HTT, where he is also the chief architect. More than 20 UCLA students worked on the project, Hodgetts said. One student currently is a full-time employee. The company is constructing a test track with five miles of tubes in conjunction with a planned community in Quay Valley, which is about halfway between Los Angeles and San Francisco. HTT’s plans call for magnets to suspend pods and shoot them through tubes at 760 mph. While much of the technology for building such a system exists, the challenge is combining them into a precision mechanism, Hodgetts said. “What’s going to be required, the effort and sweat, is making it all work together,” he said. The goal of SpaceX’s contest is to spark ideas. More than 100 student teams are gathering at Texas A&M University over the weekend of Jan. 29-30 to have their concepts judged for a chance to build prototypes for the final round of competition this summer on a SpaceX test track in Hawthorne, CA. Undergraduate students from UC Merced design a braking system for the Hyperloop competition. UC students are fielding nine teams from UC Berkeley, UC Davis, UC Irvine, UC Merced, UCLA (independent of the Department of Architecture and Urban Design), UC San Diego and UC Santa Barbara who have created concepts for pods and other aspects of making Hyperloop work. UC Merced mechanical engineering student Benjamin Bocanegra said the contest is the “opportunity of a lifetime” and a chance to work on something that could revolutionize transportation. He leads the UC Merced Hypercats team, which has come up with a design for an emergency braking system that relies on air brakes, airfoils and wheels with brake calipers. Since the Hyperloop has never been built before, the team had no models to rely on, Bocanegra said.